New York : Nan A. Talese, c1996. Grace Marks is an actual historical figure who was convicted of murder in Toronto in 1843. Originally given the death sentence just like her co-defendant James McDermott, the judge acquiesces to local sentiment and reduces the sentence to life in prison. In her novel, Alias Grace, Margaret Atwood has scoured the historical documents and done what all truly great historical fiction writers (Hilary Mantel comes immediately to mind) do: filled in the gaps in the history of the story with a compelling narrative while, at the same time, staying true to the history that is already documented. The result had me furiously turning pages well into the night. Much of the book is told by Grace herself with a great deal of the narrative taking place between herself and Dr. Simon Jordan who, in 1859, is working on behalf of a group that believes that she is innocent and should be set free. He is trying to use prevailing mental health methods to get Grace to remember her part during the murders of her former employer, Thomas Kinnear and his housekeeper/mistress Nancy Montgomery, which she seems to have blocked out of her memory. Atwood brilliantly constructs the narrative from numerous perspectives and an assortment of formats including letters, newspaper articles, legal records, poetry, third person accounts, first person accounts and Grace’s own flashbacks. In so doing, I somehow found myself questioning everything. What is the truth? Can we ever be absolutely sure? Alias Grace is a fictionalization of an actual crime that occurred in Canada in the 1840’s. Grace Marks has been imprisoned as an accomplice for a murder of her employer that happened when she was just 15 years old. James McDermott was convicted of the murder and was hung, while Grace was convicted and sentenced to death but was granted a stay of execution and received life in prison instead. Atwood does a great job of creating her own fictional details around the actual facts of the crime. She creates a fictional Doctor, Dr Jordan, who interviews Grace 16 years after the crime while attempting to research criminal minds relating to insanity. Dr Jordan has been hired by a religious group that is confident that Grace is innocent of the crime that she has been imprisoned for. He becomes a secondary narrator and struggles with his own demons and sexual nature in a restrictive and proper society. Grace claims to have no memory of the murders, but has clear memories leading up to and after the event. Many people believe that Grace is a victim of circumstances, a poor motherless child under the influence of an unsavoury character, while others believe Grace is a calculating murderess. Dr Jordan attempts to find the truth through interviews with Grace and others involved in the investigation. Alias Grace may just be the book that makes me a Margaret Atwood fan. I read The Handmaid's Tale a few years ago and enjoyed it, but never felt compelled to pick up another Atwood. However, the grade 12 class that I am teaching during my teachers' college placement is reading Alias Grace, and so I dutifully read it - and I am SO glad I did. Alias Grace is the story of Grace Marks, a woman who, at the age of sixteen, was convicted of the murders of her boss, Mr. Kinnear, and his housekeeper/mistress, Nancy Montgomery. Grace's story is true; she spent nearly thirty years in the Kingston Penitentiary in Ontario, and Susanna Moodie, a rather famous author of the mid-1800s, visited Grace in prison and wrote down her story. Atwood stumbled upon Grace while reading Moodie's Life in the Clearings, and decided to tell the story herself. To say that Atwood believes that Moodie took liberties with Grace's life would be a gross understatement; Grace's story is difficult to piece together using historical documents, as each source tells a different tale. Atwood sticks to the facts as much as possible, and where the facts are unclear, she invents her own. Atwood is an incredibly skilled writer - her way with words is unbelievable. Alias Grace is told from about five different narrative viewpoints, as it moves from Grace's account of her life, to a third-person narrator, to a group of people writing letters to each other. Every character has his or her own tone and voice and Atwood very carefully crafts their personalities. This is a long book rich with detail - since the novel is set in Victorian times, Atwood writes in a way that mirrors Victorian life: slow, detailed, and intricate. The stories are woven together like a quilt, which is one of the overriding structural patterns in the novel. "It's too theatrical, too tawdry, thinks Simon; it reeks of the small-town lecture halls of fifteen years ago, with the audiences of credulous store clerks and laconic farmers, and their drab wives, and the smooth-talking charlatans who used to dole out transcendental nonsense and quack medical advice to them as an excuse for picking their pockets. He's striving for derision; nevertheless, the back of his neck creeps" (p.476). This fictionalized account is based on the true story of 16 year old Grace Marks who was accused and found guilty of accessory to the murders of her master and his mistress, the housekeeper, in 1840s Toronto, Canada. As the book starts Grace is in prison and is waiting to be seen by a doctor who has obtained permission to study her. He is not the usual type of doctor but rather a doctor of the mind. The narrative of the book switches from the 1st person of Grace to the third person narrative of the doctor and between these narratives are letters between the characters, excerpts from contemporary papers and poetry. The switching views and narratives keeps the reading moving. I particularly enjoy this type of back and forth narrative. Atwood has done a splendid job of filling in the spaces and presenting a perfectly plausible story of what really may have happened. Once again, I am at a loss for words after reading another brilliant fictional work by Margaret Atwood. This time, I was mesmerized by Alias Grace – a complex novel based on the historical figure, Grace Marks, who was convicted of killing her employer and his mistress in 1840’s Canada. The story of Grace Marks is one of contradiction. While Atwood relied on historical accounts when she could, the many gaps in Grace’s story and her collaborator, James McDermott, was good fodder for a fictional tale. Grace offered many renditions to the story, ultimately maintaining that she experienced amnesia about the murders. McDermott, who hung for the murders, always argued that it was Grace who masterminded the murders. Grace was found guilty, but the judges felt that she was too young, uneducated and naïve to be executed for the crime. Instead, she was sentenced to life imprisonment. This is how we met Grace in this story – as a laborer in the governor’s house during the day and penitentiary inmate at night. A small group, believing in Grace’s innocence, asked psychiatrist Dr. Simon Jordan to interview Grace, to reach deep beneath her amnesia so the truth could be told about her involvement in the murders. Through these conversations, we learned about Grace’s childhood, career as a servant and eventually the murders. The story, while predominantly Grace’s, often showed the slow demise of Dr. Jordan, whose life became eerily similar to Grace’s murdered employer. Dr. Jordan was torn between solving Grace’s mysteries and keeping his emotions out of the investigation. Sprinkled in were letters from his mother, which provided great comic relief for me, as she was so passive-aggressive. I probably would want to explore mental asylums in other countries, too, if I had a mother like Mrs. Jordan. I could never shake the feeling that Grace was smarter than she wanted people to believe. Her calm, collected manner during her arrest, trial and incarceration were interpreted as “guilt,” but I saw it as a woman who was always thinking and calculating her next move. She was a fascinating character study. Margaret Atwood has taken this moment in history and created a novel both compelling and fascinating. Told alternately from the point of view of Grace and Dr. Simon Jordan - a doctor who is eager to uncover Grace's lost memories of the murders and determine her guilt or innocence - the story gradually reveals Grace's secrets and her complex personality. Margaret Atwood once again demonstrates her ability to create memorable characters and weave a story which enthralls. Atwood is easily becoming one of my favorite authors. I look at her books and hesitate to read them because I know once I have read it, it is one less book of hers I will have to read and enjoy. This book was no exception. I was amazed at the transformation of Atwood's writing style. The book takes place in 1850s, and while reading, I felt as if I could have been reading Jane Eyre or Little Women--rather than a modern author who has lived in the 1800s no more than I have. Historical fiction on the life of Grace Marks, the teenage Canadian domestic help who was imprisoned on the charge conspiracy to murder Thomas Kinnear, her employer and Nancy Montgomery, the housekeeper in 1843. She spent some years in a lunatic asylum before being moved to a regular prison and was selected by the Governor's wife, to be escorted out daily to work in the Governor's house as a maid. After being abused by doctors, she is suspicious of a Dr Simon Jordan, who visits her regularly and interviews her, with a view to gaining access to her memories in order to understand what happened on the days of the murders. Rather in the vein of [In Cold Blood] but with more obviously fictitious material, as the true crimes that Atwood writes of took place all the way back in 1843. [Alias Grace] tells the story of Grace Marks, a 16-year-old servant girl in Canada who was accused of the murder of her employer, Thomas Kinnear, and his housemaid, Nancy Montgomery. Her alleged accomplice, James McDermott, was hanged for the crimes but Grace's death sentence was commuted to imprisonment, and she spent close to 30 years in an asylum and a penitentiary. Atwood's version of the story is told partly in the voice of Grace herself and partly through third-person narrative of the experiences of Dr Simon Jordan, a young doctor in the up-and-coming field of psychoanalysis who comes to interview Grace during her imprisonment. Dr Jordan commences with the grand goal of plumbing Grace's subconscious and restoring her 'lost' memories from the day of the murders, thus settling once and for all the question of her guilt or innocence. There are two main plot lines running throughout the novel. The first is Grace's narrative, including both her day-to-day life as a prisoner and her account of her life from her childhood in Northern Ireland through the time of the murders. The second is the story of Dr Jordan, who moves gradually from brash confidence in himself, his abilities, and the worthiness of his aims, to self-doubt and explosive confrontations with a few of his own repressed demons. Not only are the characters and plot compelling, there's quite a lot of incidental history in here as well (which is great for lazy people like me who enjoy picking up facts painlessly). Grace Marks' life took place against the backdrop of the Upper Canada Rebellion of 1837, and the ongoing debate over her guilt or innocence tended to draw in issues of oligarchy versus democracy, established church versus Protestant branches, and so on. This becomes clear in the surrounding cast of characters in the novel, who all interpret Grace according to their own biases. Margaret Atwood was first presented to me as a feminist author, so I tend to think of her first in those terms (although it's unfairly limiting). [Alias Grace] certainly has a lot of potent observations on the roles and relationships of men and women in the nineteenth century (but at no point does it feel like 'feminist politics' get the better of the story). The tension between upper- and working-class also drives the story forward, as does the fear of people (immigrants, migrant workers, the insane) generally perceived as 'outsiders.' There's this sense in which people are struggling so hard to relate to each other and failing wretchedly at it because of all the masks that they wear to deceive each other and themselves. 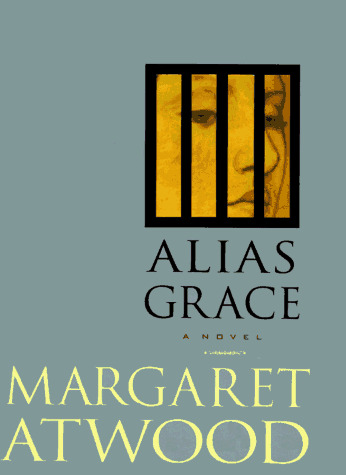 Alias Grace by Margaret Atwood delves into Canadian history for a long forgotten sensational murder case that she then proceeds to fill in, give flesh and bones to the characters, and without drawing any conclusions herself, leaves it up to the reader to decide whether Grace Marks was guilty. Using witness accounts, newspaper excerpts, letters and poems, along with various characters points of view, she tells the story of house servant, Grace Marks who is accused of participating in the murders of the housekeeper and owner of the residence she was currently working in. That Grace had an unfortunate life cannot be denied. As to her innocence, that I am not so sure of. Was she truly a clinical split personality, was she an amnesiac or was she simply a very clever woman who hid behind the mask of ignorance and insanity. Whatever the case, she paid with thirty years before finally being released and drifting in anonymity. In Canada, in the middle of the 19th century, two shocking murders have been committed. The victims are a wealthy farmer and that gentleman’s housekeeper, who was also his mistress. Two other servants in the house, Grace Marks and James McDermott, are accused of the crimes, for which they are soon convicted and condemned to die. McDermott’s guilt is unquestioned and he is quickly hung. Grace is spared execution, however, due to her gender, her age, and most importantly, a lingering suspicion that she might actually be innocent. So, is Grace the manipulative murderess she was portrayed to be at the trial or was she simply an unwitting observer to someone else’s horrible actions? A fascinating peek inside a woman's mind, an interesting portrayal of an historical period and place. Canada's version of Lizzie Borden comes to life in Atwood's tale of Grace Marks, a young woman convicted of murdering her employer and his mistress in the 1800's. More than just a tale of true crime, Atwood explores the harsh realities of early Canadian wilderness and life. - cold-blooded murderess or innocent victim of the circumstances? - prone to mental diseases and amnesia or a cunning actress? - an honest, god-fearing, simple lady or a woman overcome by jealousy and rage, leading to murder? Grace is a murderess. She collaborated with her coworker to kill their master and his mistress. So the people say. So the people want to believe. Because, let’s face it, where’s the fascination in a murder committed only by a man? There’s no sensation, nothing to stir the crowds. Whereas a woman who took a life? Well, there’s the spectacle! Never mind that she may be innocent. This is a perfect chance to humiliate women, to place the blame on them and continue the tradition that started at the beginning of time...But Grace knows the truth. Or does she? Margaret Atwood takes the story of one of the most famous female prisoners of the 19th century and weaves a masterpiece of a novel. Set in the 1840s in Canada and spanning almost 30 years, this is a confession and a fascinating journey to the mind and the life of a woman who has much to say and even more to hide. Is she a criminal? An innocent bystander? A cold-blooded killer? Is she a victim of her weak will? A small animal captured in a man’s well-constructed trap? And does anyone want to actually listen to her? When a young psychiatrist decides to dive into the darkest part of Grace’s mind, everything will change. This is a novel that I consider perfect on every level. I’ve always believed that the finest writers can give us the conclusion at the beginning of the story and we’ll still be interested and invested in the development of the action. This is exactly what happens here. While Atwood doesn’t reveal everything at once, we have all the proper materials to ‘’guess’’ the end and there is still much space for suspense, agony and, speaking strictly for me, anger. Anger was the feeling that became my loyal companion while I was reading. Anger because of the double-standards of the time, the conviction that a woman is guilty by definition when accused, the habit of regarding women as objects for the men’s pleasure, ripe for the taking...And if we come to think of it, these notions are still alive today, in our so-called advanced era when many believe that gender equality is all done and dealt with and achieved. No, when I feel frightened each time I walk down a darkly-lit alley, each time a man sideglances at me, gender equality doesn’t exist. Forgive me if I digress but fury comes swiftly when I think that in many parts of our planet tyranny and violence against women are considered the norm, they are alive and kicking and they will never stop. And where do most of these false notions come from? Prejudice, superstition, religious fundamentalism. Jeremiah, one of the most enigmatic characters of the story, provides an excellent and extremely accurate description of the absurd religious panic that inflicts people of every race and every religion. The pious, God-fearing citizens look upon men to save them and are all too willing to believe in the condemnation of women. What I enjoyed in the way this theme is delivered in Alias Grace is that Atwood inserts the influence of such stereotypes in the field of Science as well. Educated men aren’t immune to prejudice and they attempt to research Grace’s case with preconceived notions in their heads. Enter Simon, the young psychiatrist who tries a different approach to understand the incidents and the tribulations inside Grace’s soul. In the process, he finds much more than he expected. I loved the way Atwood uses the newly-born ideas of Mesmerism and Magnetism and the rising of Spiritualism that became in vogue a few years later. In addition, she addresses the issue of Hysteria, the common belief that all women were prone to uncontrollable, violent fits of rage, another token of a society that refused to believe that women are actual human beings with the right to seek sexual pleasure and fulfillment. God forbid, these are principles solely belonging to men…. It’s hard not to get political when it comes to Atwood’s brilliant novels. Grace’s background is a highly troubled one. She comes from Ulster, an extremely tormented area, and becomes an immigrant to escape a country that is dying from famine and oppression. Furthermore, Canada is still shaking from the 1837 uprising and the aristocracy has become even more intolerant and cruel to those that are considered ‘’low’’ and ‘’uneducated heathens’’. In this historical and political context, we can understand how crucial are the themes Atwood addresses and how relevant they are, especially now. The gap between the wealthy and the poor, the discriminations against women, the blind faith. Grace is a complex, intriguing character. In my opinion, she retains characteristics of the Unreliable Narrator because are we actually certain that her views on events and people are accurate? She comes across as a very sympathetic, level-headed, brave, considerate, dignified woman. She’s not afraid to express mistrust or uncertainty and has the self-discipline to keep her most ‘’controversial’’ thoughts secret until the opportune moment. Atwood takes us into Grace’s mind before she speaks and succeeds in creating a complete picture of our heroine. However, there is still an aura of mystery surrounding her and a strange, underlying sensuality and dark innocence. Apart from Grace, we have two male characters that are equally interesting and mysterious. Simon and Jeremiah. Simon is very complex, in my opinion. Very real and perplexing. He is not free from his own demons, he has some fairly obscure ideas about sexual pleasure but he desires progress and knowledge. He has travelled extensively and believes he has all the necessary means to tackle Grace’s strange case. However, he isn’t prepared enough for what is about to come. Simon gave me much trouble as I was trying to understand him and realise his motives. He is mysterious and there is definitely a darkness inside him so he is an excellent counterpart of Grace. Jeremiah is a walking riddle. A man of the world, a magnetic presence, an enigma. This review may come across as passionate or even politically incorrect but when books make you feel so many powerful emotions after reading a few chapters, you know they have succeeded. When the author is Margaret Atwood you know you are in the safest hands possible. This is a classic, a novel that should definitely be included in the finest of the 20th century. Oh, and certain misogynists/trolls/pseudo-scholars that have been lurking on GR lately, better stay away from Atwood’s novels, like The Handmaid’s Tale or Alias Grace. They will prove bad for you sensitive moral values and blood pressure….